Spring is here! Here are a list of Easter Egg Hunts and activities around Playa Vista. Comment below if you know of any others we can add to this list. Breakfast will be catered by Creme de la Crepe. Enjoy arts & crafts and don’t miss a special visit from the Easter Bunny. RSVP required. Pricing: $10 per adult, $6 per child. Create a colorful Easter craft, a visit with the Easter Bunny, dance and sing along with the DJ and win prize baskets at this free event! The party starts at 9:30 AM with an Easter Bunny meet and greet. 10a: Crawlers and walkers, 2 & under, 3-4 years. 10:30a: 5-6 years, 7-8 years, 9-12 years. 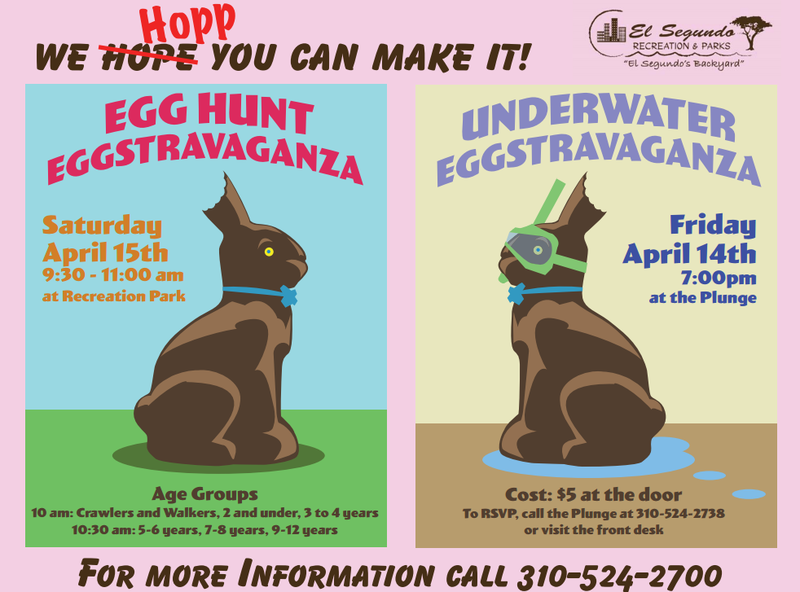 Palms will be collaborating with Mar Vista Recreation Center in putting on a fun filled Spring Egg Hunt. There will be an Egg Hunt, games, arts & crafts, and an appearance by the Easter bunny. Activities include games, egg hunt, face painting, prizes, and a special appearance from the Spring Rabbit.